M. C. Pearson graduated from San Jose State University with a B. A. in art, served as a multi-media illustrator in the United States Army, earning the rank of sergeant, and spent four years as a house parent for at-risk youth. Now married over 20 years, she homeschools her two children, volunteers with her church youth group, and runs a book review blog alliance (FIRST Wild Card Tours) while writing and drawing. She lives in the beautiful state of North Carolina. F.A.I.R.I.E.S. 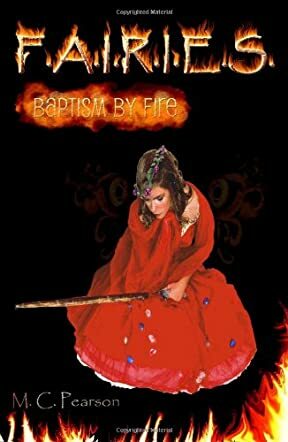 : Baptism by Fire is her first novel. This is a fantasy tale of good versus evil through the eyes of a young teenage girl, Mellie. Running from her sisters’ taunts, she finds herself caught up in the world of the F.A.I.R.I.E.S, where she will learn the world of spiritual warfare against the I.M.P.S. as she attends the F.A.I.R.I.E.S. academy and learns of the One–the light who always overcomes the darkness. The unbelievable characters become a part of your life, as you learn of their ways. The military academy is tough, yet most of the classes are enjoyable and instructive. Plenty of humor is there, though some is lost in interpretation! I enjoyed the characters of Mellie, Spike, Lizzy, GroBe, and many others. They are rich, descriptive and eccentric. They are truly fantastical beings! What a super delightful book with deep spiritual meaning. The spiritual aspect is what makes the book so great, as it pertains to each of the characters and to us as well. I loved it. Your kids will, too! This would make one extra-special birthday, Christmas, or any special occasion gift for some young girl or boy! Your child(ren) will learn truths that are pertinent to their lives. Pick one up today! Superb, intricate writing. Christian fantasy at its best! I am rating this a 5 out of 5! I’m so excited as I never used to like books like this, let alone loving this one! This should become a classic for years to come!